“Where’ve you been Henry? Your father and I have been worried sick” exclaimed Mrs Ivanhoe at the dinner table. Henry was so lost in thought he didn’t even blink. “It’s no use Kelly” Mr Ivanhoe sighed. That night Henry tossed and turned in bed. Who is this Mr Jenkins? Why does he always wear that silly top hat? WHY! “I must investigate tomorrow morning” Henry told himself. The next morning Henry went to the shops and waited for Mr Jenkins to walk past the “milk” aisle. Finally after waiting for what seemed like forever, the strange man walked past. This must be a daily thing Henry thought. He followed the man to the same house, except this time Henry waited in his garden and looked through the only window of the house. Mr Jenkins had walked in the small room which Henry assumed was the kitchen and dialled a number on the old fashioned telephone “Yes, I have the boy... of course he’s right in the garden... yes, and eavesdropping” the strange man said into the phone. “Surprise!”BANG! Henry felt a heavy object fall on his head, and lay on the garden bed unconscious. Henry woke up to find himself sitting on a rickety old chair in a little room, bound by ropes. “Hello?” Henry yelled helplessly. Henry yelled and yelled but no one came. He had to find a way to get out of this chair and escape from this place, wherever it was. Henry used all his strength to unbind the ropes but couldn’t quite do it, “It’s no use I’m going to be stuck here forever.” He sighed. Suddenly Henry heard big footsteps outside his door. A squat man walked in and glared at Henry. “Tell me what you know and I’ll let you go” is all he said. Henry gulped. “Know about what? I don’t know what you’re talking about sir”, Henry said honestly. “HAHAHA, very funny, don’t play dumb kid, I know you want the box” The man laughed. What box? Henry was really confused. He had no idea what the man was talking about. After a while Henry thought of a great idea, he would pretend to act all guilty and pretend that he was planning to steal the box and he’d be let go. “You’re right sir, I was planning to steal the box. You caught me red handed”, Henry said with a mournful look on his face. The man looked at him suspiciously and slowly untied the ropes around Henry’s wrist. The man dragged Henry down a steep set of stairs and said “Mr. Jenkins and I have our eyes on you” and with that slammed the door. Henry walked the long walk home and got a lecture about sneaking off. He needed to know more about this box and why it was so special. Henry decided that the next morning before school he would follow Mr. Jenkins to his little house and search for the box in the garden and if he couldn’t find it there, in Mr. Jenkins house. “Here I am in the supermarket again” Henry said quietly. “Henry, what are you doing here?” Henry spun around to find Mia, one of his classmates at school. “Uh, I was just getting some milk for my mum.” He quickly grabbed some milk and pretended to walk up to the counter and as soon as he got there he snuck back down a different aisle. Henry waited for Mia to go and continued hiding in the milk aisle. About 5 minutes later Mr. Jenkins walked past and Henry followed him, more cautiously this time. He sneaked into his garden and started to search for the box “Nothing here”, Henry sighed. Henry decided to wait for Mr. Jenkins to leave his house. He would sneak in through a window and if he’s lucky Mr. Jenkins might leave the door open. Finally Mr. Jenkins left, but unfortunately didn’t leave the door open or unlocked, so Henry walked around the house and found a slightly opened just open enough for him to crawl through. He quietly crept along the hallway into what he assumed was Mr. Jenkins’ bedroom. Henry raided all the drawers, but found no information about the box or the actual box. Next he looked in the lounge room and found a piece of paper saying ‘up, up, left’. It must be a clue of some sort Henry thought. He put the note in his pocket for safe keeping and searched for more clues but had no luck. CLICK! Oh no Mr. Jenkins was back. Henry had to hide. He quickly slid under the couch and hoped he wouldn’t get caught. RING! RING! Mr. Jenkins picked up his old telephone and answered. “Hello... You what?!... Yes! I heard you... I told you to keep him locked up until I came... YOU ‘forgot’ well you’re fired! ...Yes fired, good day.” Mr. Jenkins dropped the phone fuming and muttering curse words under his breath. How was Henry going to get out of this mess? Finally he had his chance when Mr. Jenkins went into another room. Henry snuck over to the door and quietly snuck out. “I’m glad I got SOMETHING out of that” Henry sighed. Henry quickly hurried to catch the bus to the station closest to his school. Luckily Henry had only spent around 40 minutes inside Mr. Jenkins house. He’d only be a bit late for school. The bus finally came and Henry rushed over from the stop to school. Mrs. Dashby, his teacher, wasn’t going to be happy with Henry. After school Henry took the bus to the town Mr. Jenkins lived in and had another quick look in the garden. This time he found an old shoe, a beer cap and lots of other pieces of junk. Suddenly Henry heard big footsteps walking into Mr. Jenkins home. Henry wondered who it was. It couldn’t be that other man he encountered earlier, he was fired. Mr. Jenkins is obviously finding a worthy companion to do all his dirty work. Henry tried eavesdropping on the conversation but couldn’t hear a word, although he did hear one word that the other man said “monster”. But could it possibly have anything to do with the box? Henry had to find out and he had an idea that just might work. Henry waited outside the little house in a disguise. He had dressed up in his father’s clothes, which just fitted Henry since he was abnormally tall for his age. He was waiting for Mr. Jenkins to greet him and take him inside. The door opened and Mr. Jenkins appeared in his familiar top hat and suit. “Hello sir, I’m assuming you’re Elliot. I’m Mr. Jenkins, hosting the interviews”. Henry merely nodded so Mr. Jenkins wouldn’t recognise his voice. Henry stepped inside the house and asked where the bathroom was. Mr. Jenkins answered ‘up, up, left’. The exact same words as on the note. It must be where the next clue is Henry thought. He climbed up the two storeys of stairs and turned left into the bathroom. Henry searched through the drawers but had no luck, and had to leave before it got too suspicious. Just as he was about to leave the bathroom he caught a glimpse of something in the corner of his eye. Another piece of paper that said ‘locked inside a cupboard’. The note was obviously talking about the box so Henry pocketed it and rushed downstairs. Henry apologised for his inconvenience and continued the interview hoping to get some information about the box. Unfortunately Mr. Jenkins only went through the rules and what kind of person he was looking for. Henry had finally memorised the way to Mr. Jenkins house from the shops and it actually wasn’t that hard to remember. There was one problem though. Mr. Jenkins wanted Henry to be his companion. That was why he was there. The good news was he was minding the house for Mr. Jenkins, so he could look for that locked cupboard, but only if Mr. Jenkins left the keys with Henry. “Come in Elliot, I shall give you a tour since you’re new”, Said Mr. Jenkins gesturing towards the door. Henry walked in and went on a tour of the house. When the tour was over he realised that Mr. Jenkins had forgotten one room. “Excuse me sir, I was just wondering what that room over there leads to?” Henry said in his best manly voice pointing towards the mysterious room. Mr. Jenkins reply was that it was strictly out of bounds and even Henry couldn’t go inside. That must be where the box is Henry thought. Mr. Jenkins handed Henry the keys and left the house. Henry straight away went upstairs to the locked room and tested all the keys. He had no luck, but there was one key left. “Let’s hope this works”. Henry closed his eyes... it fits! Henry twisted the key, opened the door and walked inside. He couldn’t believe he was this close to finding the box. Henry looked around the room for a cupboard and found one at the far end of the room. If he went on his tip-toes he would just be able to reach it. Henry found an old rusty key on the key ring that Mr. Jenkins had given him and thought it must be the key that opened the cupboard. Henry tested it out and the cupboard door wouldn’t budge. Just as he was about to give up, the cupboard gave way. Inside was a big old box .Henry took it out of the cupboard and tried a key that was different from all the others. It was a big old-fashioned one, like one out of a fairytale. The box unlocked. Henry gasped, the thing inside the box was absolutely beautiful and old with age. 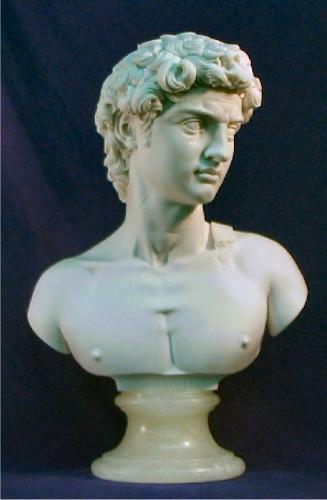 It was Michelangelo’s ‘David’ bust, one of the most famous sculptures in the world. Henry wondered if it was the original. A sudden thought came into Henry’s mind. This is the ‘missing’ sculpture that everyone was talking about. He had to return it to the museum. Henry rushed out of the house with the bust and the box. Henry caught the bus to the museum and rushed inside just before it closed. He ran to the reception desk and asked to speak to the owner of the museum. “It’s very important”, Henry said. The receptionist immediately called for the owner. The owner entered the room and walked calmly with two body guards behind him. Henry explained the very long story and showed the owner the box and opened it. The owner thanked Henry very much and the next day Henry was all over the news and on TV. Mr. Jenkins was arrested and sent to court, and everything was the way it should be.